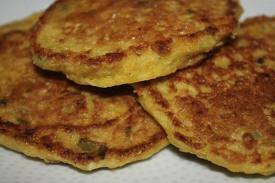 This is my quick corn cake recipe, we love it with a variety of our bean dish suppers. Sometimes we top with butter and sometimes we love to drizzle with honey. Try this it’s delicious! We use local honey purchased from Hillview Farms in Depauw, Indiana. We carry their products at the New Albany Farmer’s Market. Watch for a future article on them in an upcoming post. Mix the corn muffin batter in a large bowl. Heat a griddle or cast iron pan over medium-low to medium heat. Stir the corn kernels, orange zest and onions into the batter. Cut up 2 tablespoons butter into small bits and fold it into the batter. Use the remaining butter to lightly grease the griddle or cast iron skillet. Pile the batter into mounds 3 inches wide and cook the cakes until deep golden on each side. Repeat with remaining batter.